Video game logic rarely makes sense, you know? Like how fighting games always have characters beating each other with weapons and spilling gallons of blood only for them to simply get back up again as if nothing happened. Slice, Dice & Rice, on the other hand, treats its weapons-based combat with the realism it deserves where one solid hit almost always results in bloody death. Pair this awesomely satisfying and surprisingly strategic gameplay with absolutely gorgeous black and white (with splashes of color) presentation and you have something special on your hands with Slice, Dice & Rice. See our full PS4 review for all of the details. Slice, Dice & Rice is a world of traditional Japanese legends and historical figures mashed together into what is basically nonsense. You can play through a story mode with each character told through poetry and philosophy, but none of it really matters. All you need to know is that each of the eight characters has a distinct weapon and fighting style and looks cool as heck. 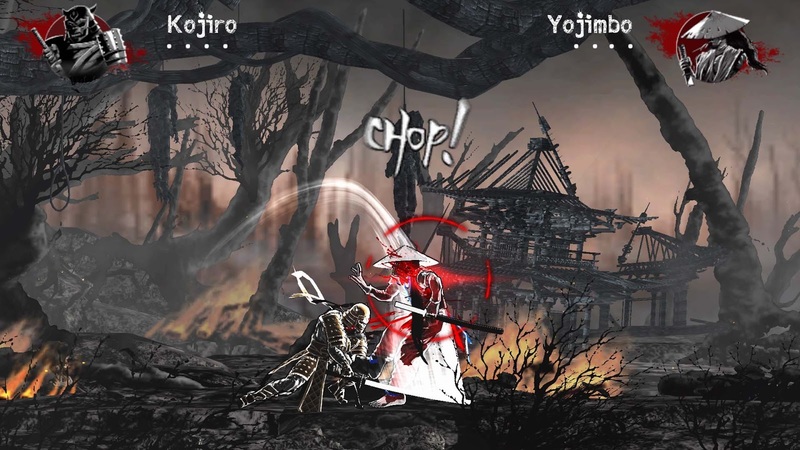 A cast of characters with different weapon types - there’s a samurai with a katana, one character has a bladed fan, another has a giant greatsword, and there’s even one that just uses his fists, among others - probably just sounds like Soul Calibur, but Slice, Dice & Rice sets itself apart in a couple of big ways – a very simple control scheme, and the fact that one hit will almost certainly kill an opponent. While each character does play slightly differently due to moving at different speeds and having different reach thanks to the weapons they use, they all share a common move set. Each character has a horozontal slice, a vertical slice, a power move, and a parry – each assigned to the face buttons. Characters can also dash forward and backward, cancel out of moves, jump, down attack from the air, and air dash. Characters also have slightly different parry timing windows as well. So the basic mechanics are the same, but the execution is different depending on whom you choose. Matches become almost a rock, paper, scissors affair as you have to decide whether to attack or parry at any given moment. A parry done at the right time gives you a momentary opening to follow it up with an attack of your own. If both players attack at the same time it creates a blade clash where neither takes damage, but deciding what to do next is vital. Do you hammer the attack button to try to get a decisive hit in (your opponent is almost certainly doing this too), hit the parry button, or maybe back dash to reset your positioning? Or do you do something really crazy like use the unblockable power move, with its crazy long windup time, to try to catch your opponent off guard? Despite everyone having the same basic moves, there is a lot of strategy here. The strategy gets even more complex when you factor in that every character also has unique movement speed and reach so every fight is different. Also, while most moves kill in one hit, if you only hit with the tip of a blade it might not kill an opponent and they’ll be able to keep fighting, albeit possibly crippled or at some other disadvantage. There is a lot of depth in spite of the simple move list, but the wildly different weapons and character abilities means the game has some built in matchup problems. One character doesn’t use a weapon at all and has to land multiple strikes before they kill an opponent, which obviously places them at a disadvantage. One character’s parry automatically follows up with a light strike, so even if you miss the parry you can still interrupt the opponent’s attack and then hit a death blow. There are just a couple of examples of the odd balance in the game. I do have to say, though, that winning a fight you know is objectively a bad matchup is incredibly fun and satisfying as any unfairness in the balance can be overcome by skilled play (that doesn’t mean it isn’t still frustrating when you lose, though). 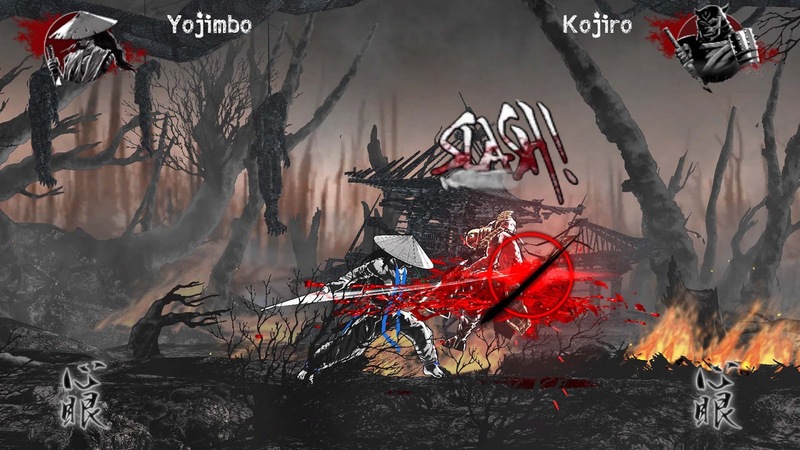 Modes include a story mode where you play through each character’s story – you have to unlock them one by one – as well as a single fight, and a training dojo. You can also play multiplayer locally or, in a much-needed feature not found in the original Steam release for the game, online play via PSN. While the single-player story mode is only OK, playing multiplayer is absolutely amazing here and why the game is so fun. The rock / paper / scissors mind games at the core of the game against real human players is incredibly intense and satisfying and easily where the game really shines. Buy Slice, Dice & Rice for multiplayer. You won’t regret it. The presentation is also absolutely fantastic in Slice, Dice & Rice and the clean black and white character models with only hints of color here and there really look awesome. The backgrounds are similarly simple, but also use color in subtle ways that is just extremely well done. The game is also bloody and gory, though, and when the serene monochromatic scenes are suddenly awash in a spray of red blood you know you’re in for a good time. All in all, I really, really love Slice, Dice & Rice. The gameplay is fantastically satisfying and rewarding despite being relatively simple and the presentation is just gorgeous looking. Do I wish there were more characters and it was balanced better? Sure I do! But for an experience this unique and this beautiful I’m willing to put up with some annoyances. The price at $18 is just about right, too. And I can’t stress enough how fun the multiplayer can be. Slice, Dice & Rice is excellent.